While traveling to any destination is great, getting your garments to and from isn’t always the case. Well Mulberrys is here is help! Here are some of our best curated travel tips to keep your clothes looking great from takeoff to touchdown! Have you ever packed a suitcase hours before your flight…only to arrive at your destination with packer’s regret? The “Luggage Layer Cake” is a tried-and-true strategy to fill your bag in the most efficient (and delicious) way possible. Place shoes and sturdier jackets at the bottom of your bag (by the wheels). This layer will act as a protective shock absorber of sorts. This layer will contain jeans, t-shirts, or casual clothes. However, instead of square-folding, we suggest gently rolling these clothes into cylinders, to both prevent wrinkles and maximize sacred space. Lay rolled clothes in a row so they form a flat second layer. Toiletries and makeup bags are usually the last thing we jam into our suitcases. However, if you can manage to place them in the middle of your bag, it will decrease the likelihood of them getting excessively bumped or spilling out. Next comes the tricky part: work clothes. 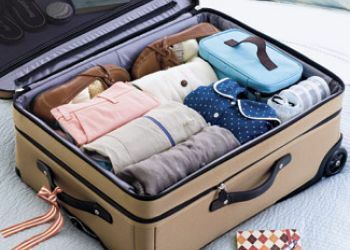 We suggest folding skirts, pants, and shirts, but layering each with non-slippery dry cleaning bags, tissue paper, or hand towels (the more slippery surface prevents folded clothes from staying in one place for too long during the flight and having creases set in). Top your luggage layer cake by laying your delectable delicates (dresses, sport coats, etc.) as flat as your bag will allow. We recommend also separating this top layer of clothes from the top of the suitcase with a dry cleaning bag or reusable garment bag. This will help keep wrinkles away, but it also will protect clothes from any items placed in the bag’s top mesh compartments. Step 1: Start by buttoning the shirt completely (including sleeve buttons) and laying the shirt face-down on a flat surface. Gently smooth out any uneven spots you see in the shirt. Step 2: Find the location on the shirt that is halfway between the edge of the shoulder and the collar. This is going to be your side fold lines. Once locating that point, fold the sleeve towards the middle of shirt’s back area. Step 3: The next step involves folding half of the sleeve back onto itself. This fold will be made around the area that usually hits the wearer’s elbow. Step 4: The last step is to, from top-to-bottom, fold the body of the shirt into thirds. Take the bottom seam and gently fold it to the shirt’s middle. Repeat a second time to the shirt’s collar. Tip 1: Plan your outfits. Much like using a work appointments calendar, try using your social calendar to outline and plan out your wardrobe needs for the trip. This will help you avoid over-packing and reduce the stress of forgetting critical pieces for your trip (we promise). Tip 2: Be versatile. It is often said that we pack 50% more items for a trip than we actually wear (Ladies and gentlemen, you know who you are…). Pack garments and accessories that “mix-and-match” well so that you can maximize your sartorial range. Scarves, colorful cardigans, belts, or fun, foldable flats will give you a lot of versatility for a lot less suitcase space. We hope these tips add to your travel delight and give you easy summertime livin’ vibes. Don’t forget to stop by your local Mulberrys store for last minute dry cleaning, pressing, and folding!